This mod adds a new feature - to trade with the inhabitants. The game will have a new beautiful and easy to use interface, where you can buy and sell things. This is very cool because it uses the GUI of Minecraft PE 0.12.1 and you will not need to download additional files. Go to villager and look at it. You will then see the button "Trade", then click on it and open trading interface. Mod supports many languages. This line adds only one thing in trade. 1id - ID of first element, 1count - amount, 1dam - damage. 2id - ID of second element, 1count - amount, 1dam - damage. resultid - it is the result of trade (you'll get this item). 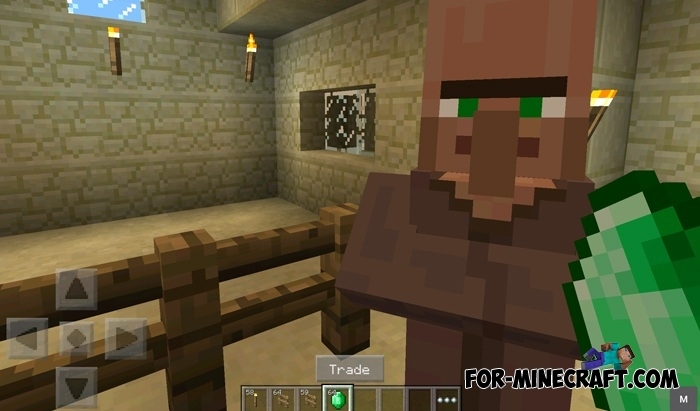 Villager Traiding mod for MCPE 0.11.1 / 0.11.0The best trade mod for Minecraft PE! it is harder than i thought plz tell me how to install the mods!!!!!!!!! Buy a compass for 10 emerald.Buy a clock for 10 clock!!! WTF!! Plz fox this trade bug! !